How do we even begin to find the words? The emotional outpouring from fans has been unprecedented in Mayberry. 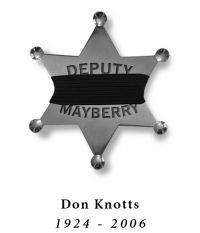 For just a sample, I encourage you to visit the Memorial Page that Allan Newsome has set up for Don at our iMayberry.com Web site at http://www.iMayberry.com/memorial/don_knotts/index.html. Read some of the comments that about 3,700 others (so far) have been moved to write, and perhaps add your own thoughts about what Don and his life and work have meant to you. 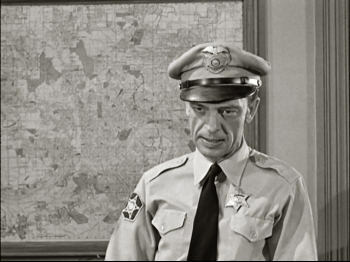 For me, Don Knotts created in Barney Fife the funniest character ever on television. I might as well go ahead and expand that declaration to include his being the funniest character in all media because there has never been another character/performer who has brought me as many laughs throughout my life. I know there are millions of us who feel the same way (and I can personally name thousands who do, including many who are reading these words). Don was a famously quiet and reserved person. Folks sometimes tell me that I'm a little that way, too. Don and I therefore rarely had extensive conversations. If we had ever decided to give each other the "silent treatment" (you know, "the Big Freeze"), I doubt that either of us would ever have been able to notice a difference in our behavior. Actually, when I was around Don, I always felt inside more the way Barney acted when he met legendary crook Gentleman Dan Caldwell in Mayberry, but I tried to keep my excitement contained as much as possible. Visiting the Return to Mayberry set was a dream experience for us because of our chance to visit with many of the actors (and director Bob Sweeney, writer Everett Greenbaum, and music director Earle Hagen), most of whom, including Andy Griffith, were folks that Ken and I were meeting for the first time. And there they all were…in character…in Mayberry. Seeing them all together again—seeing Don playing Barney—was a thrill that resonates in me. That unforgettable experience was twenty years ago this month. As I write this, I'm just now sadly realizing that as many of the original TAGS cast and crew that we met that week have now left us as ones who fortunately remain with us today. But the experiences of that week—seeing Don and other TAGS favorites working in character for the first time—created incredible memories for a couple of real-life Goobers. Another favorite memory about Don was a trip to Los Angeles that I made with Neal Brower and Jim Ballance of TAGSRWC's Barney chapter in 1997. Neal's soon-to-be published Mayberry 101 book provided our trio with a plausible reason to get together with some of the cast and crew who had been sharing their recollections about working on TAGS for the book. 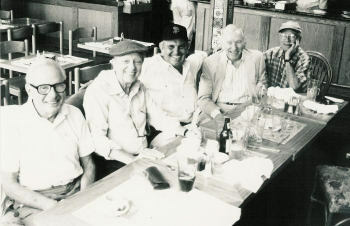 Los Angeles, CA (1997) - Meeting for lunch are (l-r) producer Aaron Ruben, Don Knotts, Ronnie Schell, Everett Greenbaum, and Howard Morris. That trip had many highlights (high among them was an extensive visit with writer Harvey Bullock, a first meeting with him for all three of us). One of largest groups of us that gathered during that trip was for a lunch at a little Italian café in Beverly Hills that could easily have been Morelli's. At the table that day were Howard Morris, Ronnie Schell, Everett Greenbaum, producer Aaron Ruben, and Don. Neal, Jim, and I couldn't believe our good fortune to be at the same table with this group. Of course, it didn't really matter to anybody but the three of us that we were there with this esteemed fivesome. And that was what made the get-together such a wonderful thing to witness. To see five of the funniest minds in the world just sitting around the table and genuinely enjoying each other's company and talking about current times and old times kept Neal, Jim, and me in awe the entire time. One of my most distinct memories about that lunch was simply observing what a natural and easy camaraderie Don had while visiting with his old buddies. They were continually cracking each other up, mostly without really trying very hard to do so, and they were also having some more serious discussions about what was going on in their lives. Just like good friends will do. It was special to watch that talented group of friends still having a ball being around each other nearly forty years after they first worked together. Though that lunch had been a purposeful gathering, it was still the only time that I was around Don for an occasion that didn't in some way involve work for him, such as a public appearance, a media event, or a performance. To be around him when he was just relaxing and visiting with old friends was a cherished glimpse for me and my two fellow flies on the wall that day. April Fool's Day 1999 was another favorite time seeing Don. 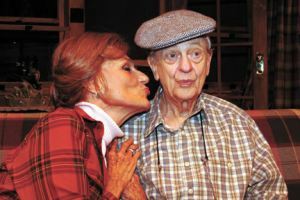 He was playing Norman Thayer Jr. (the Henry Fonda role) in a production of On Golden Pond at the New Theatre Restaurant, the acclaimed dinner theater in Overland Park, Kans., where he worked often during the last fifteen years or so. I didn't get to exchange more than just the usual perfunctory pleasantries with Don on this occasion, but the memory I will always be grateful that I experienced was seeing Don play this part, which had a lot of pathos (not as much as in the movie version with Henry Fonda, but more than just a straight comedy). He was absolutely superb. 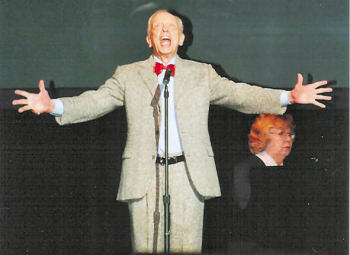 Overland Park, Kans (2003)- Don Knotts returned to the New Theatre production of "On Golden Pond" for a sold out 10-week run. The reviews were great and the show sold out the entire run. 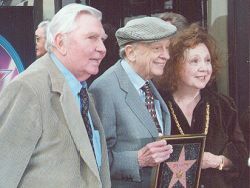 FOUR STARS SHINING BRIGHT - FOUR STARS SHINING BRIGHT -- Andy Griffith and Betty Lynn were among the special guests on hand to honor Don Knotts as he received his star on the Hollywood Walk of Fame in January 2000. In fact, seven years later I still believe Don's performance in that play was the best one I ever saw him do besides his work on TAGS. And that's really saying something because we've all seen him do many wonderful turns on stage and screen. In that show, he truly demonstrated just how much range he could cover as a performer. The deep respect I already had for him found new depths. Another favorite moment of seeing Don occurred when he received his star on the Hollywood Walk of Fame in January 2000. The ceremony itself was very nice with John Ritter and others speaking. Andy Griffith, Aaron Ruben, Betty Lynn, Howard Morris, Al Checco, Ronnie Schell, and other friends were on hand. The whole occasion was special. But the moment that made the day a classic was during the luncheon when Andy and Don got up on the dais together and did a short comedy routine that they used to do years ago. Not as Andy and Barney, but as Andy and Don. Seeing the obvious love and respect between Don and Andy in that small performance and the way they still enjoyed working together after all the years was a moment to treasure. I'm at the point where I have to make my final selection of a favorite moment to include in my personal recollections about Don Knotts. I think I'll go with his performance at the Mayberry Cast Reunion show at the Gaylord Opryland Resort in Nashville in 2001. This was the second of three reunion shows that Don would do in Nashville (the others were in 1991 and 2004). Don participated in several memorable Mayberry cast reunions for live audiences elsewhere in between those times in places such as Winston-Salem; Bradford, Ohio; Pigeon Forge; Kingsport; and Birmingham. But the 2001 show was extra special because director Phillip Stegner persuaded Don to recreate the scene where Barney "sings" in "Barney and the Choir." Not only that, but Don agreed to wear Barney's original salt-and-pepper suit to do the re-enactment. (He still had the suit.) Don shipped the suit to Nashville for alterations. Realizing the importance of the suit, Phillip brought it by my house for show and tell and a photo op. Though Don Knotts never visited my house, I'm proud to say that his salt-and-pepper suit has been on the premises! As neat as the suit might be just by itself, it was even more spectacular with Don wearing it. Don's show-stopping performances on stage that weekend are what really make that reunion show stand out in my memory. There were fantastic performances by all of the stars during that reunion, but to see Don wearing that suit on stage with a full choir behind him and his then mouthing the verses of "Welcome, Sweet Springtime" with the same gusto and bravado of Barney four decades earlier was something that none of us there ever imagined we'd be able to see in person. That is, except maybe for Betty Lynn, who had been there the first time! That sketch, which Don also reprised at his last cast reunion in Nashville in 2004, was funny just on its own merit. Many of the tour groups and accidental hotel guests who stumbled across that reunion show at the Acuff Theater surely enjoyed it just for the thoroughly entertaining experience that it was. But for the members of the audience who knew TAGS well—particularly for us diehards who know ever move Barney ever made—seeing Don do the choir scene gave us incredibly gleeful chills. It was an historic moment for Mayberry. A big part of that feeling was probably that it brought us about as close as we could ever get to being on hand for an actual moment of being with Barney in Mayberry. A bigger part of the joy, though, was simply seeing Don nail the scene and knowing what a good sport he was to agree to perform it for us when he easily could have deflected the request. Don is gone now. There will be no more encore performances of "Welcome, Sweet Springtime" in that altered salt-and-pepper suit. But Don has left us with extraordinary memories and a legacy of work that we and generations after us will cherish. I'm forever thankful that my time on earth overlapped with some of Don's time here. I believe we're all blessed to be able to say that. Here are two stories and a cartoon that I think friends and fans of Don will enjoy and that many people might not have come across in their reading since Don passed away. Don's family has not yet designated an entity to receive memorial donations. If such a designation is made, we'll pass along the information to TAGSRWC members and other Mayberry fans who might want to make a donation. TAGSRWC as an organization plans to make donations to both the family's designated charity and to the Surry Arts Council (host of the annual Mayberry Days in Mount Airy, N.C.) in Don's memory. Much of the information in this issue was being gathered for publication at the time we learned the sad news about Don Knotts. We thought about scrapping the issue's regular features in favor of doing a special issue solely about Don. But as we pulled our thoughts together, we realized just how much Don and Barney permeate all aspects of what Mayberry is about and what this newsletter covers. Every issue has many reflections, direct and indirect, about Don and Barney. Whether they be the names of TAGSRWC chapters in the Chapter Update and Chapter News sections, any number of the dozens of Mayberry products featuring Barney, or simply the trivia questions in Miss Crump's Quizzes, Don and Barney are never far from a connection to what's happening in Mayberry. And so, we have lots of news about what's going on around and about Mayberry. There are lots of happy happenings on the horizon. * Now through April 29: Ronnie Schell and Ruta Lee are starring in a second of season of "Senior Class: A Revue of the Golden Years" at the Palme d'Or Theatre in Palm Desert, Calif. For more info, visit http://www.seniorclassrevue.com or call 1-888-240-3003. * Mar. 25 and 26: James Best greets fans at the Cavalcade of Wheels show in South Bend, Ind., from 1:00 to 4:00 p.m. and from 7:00 to 9 p.m. on Saturday and from Noon to 5:00 p.m. on Sunday. For more info, visit http://www.cavalcadeofwheels.com/show.htm. * Mar. 25 and 26: David Browning does his best to nip speeders in the bud at the Bristol Motor Speedway's NASCAR race. Good luck with all that, Mayberry Deputy! * Apr. 21 and 22: Mayberry Variety Show and Jim Nabors Induction into Alabama Stage and Screen Hall of Fame in Tuscaloosa, Ala. The Friday night portion of this double-barreled weekend is a variety show at the Umphrey Coliseum on the campus of Shelton State Community College in Tuscaloosa. The show stars Maggie "Charlene Darling" Peterson Mancuso; two of her TV brothers, Doug Dillard and Rodney Dillard; Ronnie "Duke Slater" Schell; Barbara "Miss Bunny" Stuart; and Elizabeth "Lou Ann Poovie" MacRae. Also appearing will be Mayberry Tribute Artists, including David "Deputy" Browning, Allan "Floyd" Newsome, Kenneth "Otis" Junkin, Jeff "Howard" Branch and Jamie "Opie" Sullivan, among others TBA. Showtime is 7:30 p.m. and will be followed by an autograph session with the stars. Tickets are $25.00 and are on sale now. Tickets and info may be obtained at (205) 391-2277. The next night, April 22, Jim Nabors will be inducted into the Alabama Stage and Screen Hall of Fame. The gala (black-tie) evening will take place at the Bean-Brown Theatre at Shelton State Community College (home of the Hall of Fame). Ronnie Schell, Barbara Stuart, and Elizabeth MacRae are among the stars who will be on hand to help Jim Nabors celebrate that night. The other inductee into the Hall of Fame this year is Rick Bernstein, HBO Sports Executive Producer. Among those on hand to honor him will be NFL analyst and former Cincinnati Bengals star Cris Collinsworth. The master of ceremonies for the entire evening is comedienne Brett Butler. The Hall of Fame festivities begin with cocktails and silent auction at 6:30 p.m., dinner and induction ceremony at 7:30 p.m., a performance by Brett Butler at 9:30 p.m., and a reception and dancing at 9:30 p.m. General public tickets ($100) are available now through the same number listed above for the Friday portion of the weekend. A listing of local accommodations may be found through the Tuscaloosa Convention and Visitors Bureau Web site at www.tcvb.org. The closest hotels to Shelton State Community College are the Courtyard by Marriott, Fairfield Inn, Hampton Inn University, and Holiday Inn Express. Ask for the Alabama Stage and Screen Hall of Fame event rate. Most hotels are offering one. * Apr. 27 and 28: Doug and Rodney Dillard, and Maggie Peterson Mancuso perform at MerleFest in Wilkesboro, N.C. Among the highlights will be Maggie performing a couple of songs with the legendary Doc Watson on the Creekside Stage between 2:10 and 2:55 p.m. on Fri. (The all-star Americana music festival continues through the 30th, including Rodney and Beverly Dillard playing a Gospel show on the 30th.) Tickets are on sale now. For more info, visit www.merlefest.org. * Apr. 28: David Browning falls to pieces at the Salem (Va.) Avalanche baseball game. * Apr. 29: Doug and Rodney Dillard perform at the Walhalla Civic Auditorium in Walhalla, S.C.
* Apr. 29: David Browning monitors drag races at the Bristol Motor Speedway (but "don't tell my daughter-in-law"). * May 12: It's time for good ol' rock and roll when David Browning slides into Salem (Va.) again for Avalanche baseball. * May 19: Release date for The Da Vinci Code, directed by Ron Howard. * May 20: David Browning taps his foot to keep with the rhythm of the Blue Ridge Jamboree at the Andy Griffith Playhouse in Mount Airy, N.C.
* June 2 and 3: David Browning and others add Mayberry flavor to Mule Days in Gordo, Ala.
* June 9: David Browning lets the Warthogs out for baseball in Winston-Salem, N.C.
* June 13: Jim Nabors performs at the Mohegan Sun Casino and Hotel in Uncasville, Conn. For more info, visit www.mohegansun.com. June 15-17: Memphis Film Festival at Whispering Hills Hotel and Convention Center in Olive Branch, Miss. Stars with Mayberry connections attending so far are Maggie Peterson Mancuso, Elizabeth MacRae, and Robert Easton (Pete "Eyelashes" Johnson in "Irresistible Andy" episode). For more info, visit www.memphisfilmfestival.com. * June 23 and 24: Betty Lynn, Maggie Peterson Mancuso, and Keith Thibodeaux have been announced as stars of the first Mayberry Comes to Tuscaloosa County festival to be held in Tuscaloosa and Northport, Ala. Tribute artists joining the stars for the two-day celebration include David "Mayberry Deputy" Browning, Allan "Floyd" Newsome, and Kenneth "Otis" Junkin. Others are expected to join the lineup. A Friday dinner will include Q&A with the stars, a celebrity auction, and entertainment by top local performers. During the day on Saturday, downtown Northport will become a beehive of Mayberryish activity with trivia, look-alike, and whistling contests, and perhaps homemade pickle and rock-throwing contests. (Or maybe a homemade pickle throwing contest if Aunt Bee makes a double batch again!) There will be a manicurist on duty and music and who knows what all. Saturday night will feature a Mayberry Variety Show at the Bama Theater in Tuscaloosa, with the stars and tribute artists and other entertainers. Show times and ticketing info are still TBA. We'll post updates here as soon as we have them. Mayberry Comes to Tuscaloosa County is a fund-raiser for Eagle's Wings, a local group that is working to build a facility that creates a "nurturing and caring Christian community for individuals with special needs." * June 30 - July 4: David Browning patrols the Grundy County Fair in Mazon, Ill.
* July 29: 6th Annual Mayberry Squad Car Nationals in Graysville, Ala. Details TBA. * Aug. 18: Mayberry Night at the Oakboro Music Hall in Oakboro, N.C. Details TBA. For more info, visit www.oakboromusichall.com. * Sept. 21-24: 17th Annual Mayberry Days in Mount Airy, N.C. Visit www.surryarts.org or www.mayberrydays.org for more info as it becomes available. * Oct. ?? and ?? : Mayberry Comes to Cocoa II in Cocoa, Fla. Definite dates and further details TBA. * Oct. 23 -27: A Cruise to Mayberry via the Caribbean aboard Carnival's Fascination ship. http://www.iMayberry.com/tagsrwc/wbmutbb/anewsome/private/cruise.htm The 4-day cruise departs Miami for Key West, Cozumel, and a day at sea. Maggie "Charlene Darling" Peterson Mancuso and dobro-playing Country Boy LeRoy McNees (from the episode "Mayberry on Record" and a regular at Mayberry Days) have been confirmed to be cruising. Neal Brower, Author of Mayberry 101 will present Professor Brower's Lecture. Tribute artists Allan "Floyd" Newsome, Phil "Ernest T." Lee, Kenneth "Otis" Junkin, Tim " Goober" Pettigrew, Jeff "Howard" Branch, Jamie "Opie" Sullivan, and Bob "Briscoe" Mundy will also be cruising. Other Mayberry stars and "tribute artists" TBA. Rates start at $249 plus $132 Port Tax per person, based on two per cabin. For more info, call Sharon Euliss at All About Cruises in Burlington, N.C., at 1-800-832-7993. Or e-mail her at PWESJE@aol.com. "Arrested Development," which Ron exec produced and narrated, has finished its run on Fox, which burned off the last four episodes against the opening ceremonies of the Olympics. But there's still a flicker of hope among the show's loyal, but apparently small audience, that another network will pick the show up for another season. Father RANCE HOWARD and brother CLINT are both busy with several independent films being filmed now or coming up, including a couple that have them working together. GEORGE LINDSEY had a hugely successful George Lindsey/UNA Film Festival. This year's ninth annual festival also included the regional premiere of When I Find the Ocean, an independent film in which George plays a preacher. Academy Award nominee Diane Ladd was among the stars who attended the festival and premiere. George has several tour dates in the works during the next few months (see the Event Calendar above). BETTY LYNN reports that's she's doing well and is looking forward to participating in at least a couple of the Mayberry events planned for this year. Maggie Peterson Mancuso likewise appears likely to have five or six personal appearances at mostly Mayberry-related events during the coming months. LEROY MCNEES has had an extremely busy the last few months on the road with wife Jan. He has played concerts and bluegrass festivals from Florida to California. They drive-manic duo have even made a couple of stops in Nashville. Along the way they also found time to help build a Habitat for Humanity house in Florida, plus LeRoy cut a new CD of original songs called Scratchin' My Beard. (We hope to carry it at Weaver's as soon as we can get it in.) LeRoy and Jan will be making their way back to California this month, but we're sure it won't be long until they're on the road again for more "retirement" activities. We've recently been working hard on re-designing our Weaver's Dept. Store site at www.iMayberry.com. Webmaster Allan Newsome has given it a fresh, clean look that has been organized to make shopping easier than ever. We've added several new features, including an option to register on the site to create a Wish List and monitor the status of your orders and much more. The Complete Fifth Season of TAGS on DVD was released on Feb. 14, and we've got it at Weaver's. Some of the highlights are below. The Complete Sixth Season is scheduled to be released by Paramount on May 9. We'll start taking pre-orders at Weaver's beginning April 20. Here are some current offerings at Weaver's. The price for both the DVD set and the card set is only $40.00, which is the suggested retail price of the DVD set by itself. By themselves, theses items have a suggested price of $65.00 (and even a Weaver's price of $57.00), but with this combo, you get the three items together for just $49.00. The suggested price for all of these items would be right at $70, but with this combo, you get all four items for only $52.00. "And that's the way the Dipsy-Doodle works!" We also still have DVD sets for the Complete First, Second, Third and Fourth Seasons available as individual seasons and in various combo offers. See details at the Weaver's site online. * Classic Barney Silk Necktie $18.00 NEW! This brand new silk necktie features Barney in black and white (it therefore coordinates with any outfit). Anyone who wears this tie is guaranteed to look suave and worldly. Wear it with the old salt and pepper and it's just right for the dips. Made with fine silk from the Orient. NOTE: Our first shipment was very small, so this initial offering may not last long. We have some more on order and expect to receive them by late Spring. * Mrs. Mason's 46th Anniversary Mayberry Photo Grab-Bag $40.00 NEW! As part of his continual cogitating about fun ideas that can help raise money for good causes, ol' Ben Weaver has recruited Mrs. Mason, the photo expert from down at the drugstore, to come up with this grab-bag of photos. In commemoration of the 46th Anniversary of TAGS this year, Mrs. Mason has gathered 46 photos of the TAGS cast and crew and put them in this special grab-bag to raise money for TAGSRWC's and Weaver Department Store's commitment to support Mayberry Days and the Surry Arts Council. Every penny of the sales price of these photo grab-bags will go toward the Surry Arts Council and its efforts with Mayberry Days. The vast majority of the photos are 8x10s, but each grab-bag will contain some 5x7s. Most of the photos are black and white, but there are a few color shots as well. The photos are primarily publicity shots used by the stars themselves or productions they were involved with before, during, or after their time on TAGS. A lot of the photos are left over from publicity shots that the stars used to request that TAGSRWC print up for them to use at various Mayberry events. For the last several years, the stars have generally provided their own photos at these events, so we no longer have a need to maintain a reserve of photos for them. We've also included some of our other duplicate photos that we have accumulated in our TAGSRWC Archives during the last quarter century. There are a few photos in each grab-bag that we have never seen published, so there's a good chance that there will be some photos that many fans have never seen. At less than a dollar per photo, we think this grab-bag is a real bargain. While any given grab-bag will have some number of photos that you might not ordinarily have purchased (even for less than a dollar), there likely will be a far greater number that will clearly be valued at $3 or more. And though they're not officially part of the grab-bag, Mr. Weaver will also throw in an extra four photos to bring the total to 50 in each grab-bag. (Forty-sixth anniversary not withstanding, ol' Ben just likes nice round numbers.) The extra four photos will have blemished borders that make them not sellable by his standards, which is why they're not officially included in the grab-bag. And if Ben is feeling extra nice the day you order, he'll likely be moved to throw in another extra thing or two. It's a grab-bag, so you just never know! Anyway, get your photo grab-bag today and picture yourself helping a worthy Mayberry cause! NOTE: We expect this Grab-Bag will sell out in a very short time because folks started buying it even before we had a chance to get the word out about it in this delayed newsletter. This catchy CD single from the full-length CD Meant to Be by the award-winning country duo Moore & Moore is currently in limited release, but we've got them at Weaver's. It's a fun song from talented sisters Carrie and Debbie Moore. The song features George Lindsey chiming in several times. Besides being a song that you'll be singing to yourself before you realize it, it's also destined to be a collectible. Listen to a Darlin' Boy talk! Rodney Dillard finds inspiration for lessons in episodes of "The Andy Griffith Show." In 25 one-minute segments that were originally syndicated radio broadcasts, Rodney recalls scenes and episodes and applies them to daily living. While those Darling boys weren't talking, they obviously were doing more thinking than some folks gave them credit for. This brand new, 40-page songbook has sheet music (and lyrics) for 26 favorite Dillards tunes, including almost everything the group played as the Darling Boys on "The Andy Griffith Show." There's a Foreword by Mitch Jayne, a Preface by Rodney Dillard, and a Discography, plus some fun photos of the group that were taken at Mayberry Days in Mount Airy, N.C., in 2004. This is a "must have" item for any fan of The Dillards and Mayberry, whether the instrument you play is stringed or you just get your guitar and banjo sounds out of a jug the way Briscoe Darling does. Either way, there'll be more power to you with this superb songbook covering four decades of Dillards classics. "Wynkum, Pynkum, Nodimus Rex, Protect Us All From the Man with the Hex" Chattaroy, Wash.
You, Me, Gomer, and Laura Lee Hobbs Woodstock, Ga.
Don Knotts Memorial King, N.C.
That brings our total number of chapters since TAGSRWC was founded in 1979 to 1,294. Chapters are also in the works (or at least being talked about) for several other locations. The Taylor Home Inn, a bed and breakfast in Clear Lake, Wis., built and operated by Marsha and Dave Scheurermann of Mayberry Scout Troop #44 chapter, was featured early this year in a big story in the Minneapolis Star Tribune. They've also done some radio publicity, and a story is in the works by a local TV station. The inn, which is designed as a replica of the Taylors' home in Mayberry, will have its official grand opening in April. Marsha and Dave have gone to great effort to make their Bee & Bee as close as possible to the TV version of the Taylor home. They've made a few adjustments to keep the house up to 21st century codes and comforts, but the attention to detail in the design and décor are sure to please any Mayberry fan. We don't know if there are any plans to host a Summit Meeting with world powers, but the Taylor Home Inn is destined to become a happy gathering place for Mayberry fans. For photos and more info, check out their Web site at www.taylorhomeinn.com. Anyway, Dave narrowed the field of possibilities and then pinpointed an exact match. And the location is….Cincinnati, Ohio. You see, that's not Old Man Kelsey's Crick winding its way through the map in the Courthouse. It's the Ohio River. Not only have Dave and Marsha identified the city, but they've also tracked down a copy of the exact map that hangs in the Courthouse. It's a 1951 map of Cincinnati. As to why the Mayberry Courthouse would have a map of Cincinnati on its wall, we can only speculate that there might be some chicken thieves and whatnot up that way and that Andy and Barney (O.K., mostly Barney) had big plans for tracking them down. Whatever the case, our hat's off to Dave and Marsha for some mighty fine detective work. And for anybody who had doubts about their serious attention to detail in constructing their Taylor home, this map story should nip those notions…in the bud! Elsewhere, among the chapters spotted attending the George Lindsey/UNA Film Festival in March were "Irritatin', Ain't It?" (Fall Branch, Tenn.), "Hit One for the Ol' Goober" (Killen, Ala.), Andy chapter (Nashville, Tenn.). "Doggone Firefly Hit Me, Knocked Me Right Down" (Huntingburg, Ind.) recently distributed an issue of their newsletter, The Firefly, that celebrated their 15th anniversary as a chapter and of the newsletter. Just weeks later, they were the first chapter out of the blocks with a special issue paying tribute to Don Knotts. And we're delighted to report that the fabled Schwumpsters chapter (Stephens City, Va.), led by John and Mary Lock, is showing signs of crawling out of hiding underneath their toupee and may start having meetings again. Longtime TAGSRWC members will recall the chapter's streak of trivia-contest dominance in the early years of Mayberry Days. Though they may be retired from competition, we're keeping our fingers crossed that they will give their nod to Mayberry Days once again this year. Several chapters are involved in organizing Mayberry events coming up this year. In the meantime, most chapters are in their quiet time of year (other than regular chapter meetings). But with all the events cooking for this year, members of many chapters will soon be hitting the road to take in some of the fun. This quiz brought out entries mostly from tried-and-true quizmasters. (In fact, even Dennis Beal and Paul Mulik still submitted answers, even though both were not eligible for prizes. Trivia is just a compelsion for some folks!) Two recent champions were the only ones (besides Dennis and Paul) to submit quizzes with all the right answers. Rather than drawing a winner from just two qualified entrants, Miss Crump is going to award a prize to both Barbara Adams of Gainesville, Fla., and Stan Nicholson of Ash Flat, Ark. Barbara and Stan each gets to pick any single item currently offered at Weaver's (except for items in the Special Items and Collectibles categories. Congratulations to both winners. For everybody else, see the new quiz below for how Miss Crump is going to try to level the playing field for other pupils. 1. An instance when Wyoming is mentioned in Mayberry is when "Runaway Kid" George "Tex" Foley says that maybe Wyoming is the place where he's headed with his wagon-load of peanut-butter sandwiches. 2. Four babies who are seen or talked to in Mayberry (with babies in this case being children who are young enough to be in a baby carriage and/or are not old enough to walk upright without assistance) include Andy Becker, whom Andy delivers while Barney keeps "Quiet Sam" Becker occupied; twins William and Robert Buntley, whom "Stranger in Town" Ed Sawyer distinguishes when passing them in their carriage on the street; little Jeremy Ambrose, who routinely gets dropped off for babysitting at the Courthouse, much to the dismay of new Mayor Stoner; "Darling Baby" Andelina Wash; the Garlands' baby son, who's seen when "Opie Finds a Baby" on the Courthouse steps; Evie Joy, the "Baby in the House" left with Aunt Bee by parents Darryl and Martha while they travel to Jersey City; and the baby Sam Jones has to hold and kiss when running for Town Council. We also see baby pictures of Andy Taylor. 3. Five distinct instances when something or somebody in Mayberry is described as being a rose or like a rose could include old housekeeper Rose, who leaves when "New Housekeeper" Aunt Bee arrives; "Shimmering Rose" powder that is mentioned after "Ellie Saves a Female"; the woman wearing the "green hat with pink baby roses" who's speeding out on Highway 6 when Barney's patrolling with his motorcycle; Barney's aftershave that captures "the fragrance of Riviera rose petals," which we find out when he's having to deal with "Andy and the New Mayor"; a pink rose that Charlene says Andy is prettier than; the roses that Aunt Bee admires on the mustache cup that Mr. Frisbie gives her; the rose poetry Aunt Bee reads when "Briscoe Declares for Aunt Bee; Rose Blake, who "Those Gossipin' Men" might hear goes to Raleigh to get false teeth; "as fine a Peabody rose as I've ever seen," which is admired during "Aunt Bee's Brief Encounter" with handyman Henry Wheeler; "Roses Are the Backbone of Your Garden," which we find out by the book mentioned when "Politics Begin at Home"; the roses of her mother's that "Opie's First Love" Mary Alice Carter prefers to water rather than go on a date with Opie; Mrs. Pinckney's Variegated Red rose; Alma Swarthout's Sunset Pink rose; Aunt Bee's Deep Pink Ecstasy rose; and Clara's Snow Valley White rose. 4. The woman whose first husband is reported to have gotten run over by a team of hogs is Briscoe's wife, mother of Charlene (and the boys). 5. The Mayberrian who would have to be considered the most likely to be a close enough look-alike to Ed Jenkins that he or she could be his twin is Howard Sprague, who could easily fill the bill of the insurance agent handling a "Lost and Found" claim. BONUS: Six humans in or around Mayberry who have been seen either up in a live tree or fastened to one include Andy and Barney when scouting for Eddie Brooke before and after "Barney Gets His Man"; Jess Morgan and Mayor Stoner when the bear stirs up trouble for "Andy and the New Mayor"; the escaped convict that Andy ties up to the tree while on vacation; Warren and Goober when they're watching Andy and Helen after receiving a "Warning from Warren" that something might go wrong; and Goober "Big Ears" Pyle helping the crazy owl fly upside down when Andy's trying to rescue Helen from "The Darling Fortune." Opie is also kind of up in a tree when he's initially feeding Winken, Blinken, and Nod. And it could be argued (weakly) that the men sawing down the old oak tree when "Mayberry Goes Hollywood" are momentarily fastened to the tree when their saw makes brief contact with the tree. Seeing that hard quizzes and star quizzees seem to be scaring off other contestants, Miss Crump is really going to lighten up this time. At the same time, she's also going to let Dennis Beal and Paul Mulik out of their cells and allow them to be eligible for prizes again. But worry not (at least for this quiz), all you trivia also-rans, because the questions this time are guaranteed to be reasonable for even a moderately casual observer of Mayberry. This quiz is all about Barney. And the prize is, too. It's a nicely framed picture of Barney autographed by Don Knotts. (It's like the one we used to carry at Weaver's and similar to the one of Gomer Pyle signed by Jim Nabors that we still carry.) This quiz should be easy, and the prize is top-notch. If you don't enter this contest and make yourself eligible for the drawing, then Miss Crump has a cone-shaped hat that she's waiting to give you to wear. 1. Fill in the blank: "_ _ _ it in the bud!" 2. In which of his two shirt pockets, besides his right one, is Barney most likely to keep his one bullet? 3. Name the lady who is Barney's steadiest girlfriend and eventually becomes his wife. 4. Who is the one neato waitress at the diner that Barney sometimes dates and is sometimes seen talking to on the phone? 5. True or false. Barney's gun sometimes fires when he doesn't intend for it to do so. BONUS: Name one of your favorite Mayberry moments involving Barney. The deadline for entries to be postmarked (when sent to TAGSRWC's HQ in Nashville) or sent by e-mail to MissCrump@iMayberry.com is April 15, 2006. If there's a tie for the entry with the most right answers (and there had better be! ), we'll draw the winner from a hat. We'll print the answers and announce the winner in the next issue of The eBullet, scheduled for late April. Good luck and have fun! Between issues of The eBullet, keep up with the goings-on in Mayberry with the more-or-less daily "Who's Been Messin' Up the Bulletin Board?" Digest. It's a free subscriber list that consists entirely of comments, newsflashes and questions and answers from subscribers. You can sign up for that list by going to the "Mailing Lists" link at http://tagsrwc.com. TAGSRWC also publishes Weaver's Newsletter in more-or-less alternate months to The eBullet. Like The eBullet, the Weaver's Newsletter is free. Its focus is mainly on new Mayberry merchandise and collectibles and quick newsflashes. To sign up, go to http://www.tagsrwc.com/ebullet/joinebullet.htm. TAGSRWC's other main vehicle for Mayberry information is simply our Web site at www.tagsrwc.com (and it's nearly identical sister site www.iMayberry.com. It has extensive content and links for just about everything a Mayberry fan might be looking for. The next issue of The eBullet is scheduled for late April, with a Weaver's Newsletter planned in the meantime.